On 12 Aug 18 the five nations that border the Caspian Sea signed a historic agreement that will have very significant impacts in Eurasian relations and integration, probably far into the future. The five nations – Iran, Russia, Kazakhstan, Azerbaijan and Turkmenistan – signed the agreement at Aktau, Kazakstan after over 20 years of difficult negotiations. Media outlets from around the world covered the event. The convention has solved many security issues for the region, has defined borders in the Caspian Sea and enables unfettered implementation of energy projects and transit, provided the signatory states agree. It also stipulates that no foreign powers – such as the US and NATO – can place military bases in those nations. The last two points, energy and military bases, have foreign policy planners in Washington and London royally peeved, because it shuts the US and UK out of the immediate region and greatly benefits China’s Belt and Road Initiative, not to mention significantly easing Russian security concerns. Two of the signatories – Russia and Iran – are guaranteed a free transit route between them, in case any great troubles were to take place with Iran, another factor which has particularly irked Washington, because Western powers would not be able to interdict such shipments directly from the states involved. 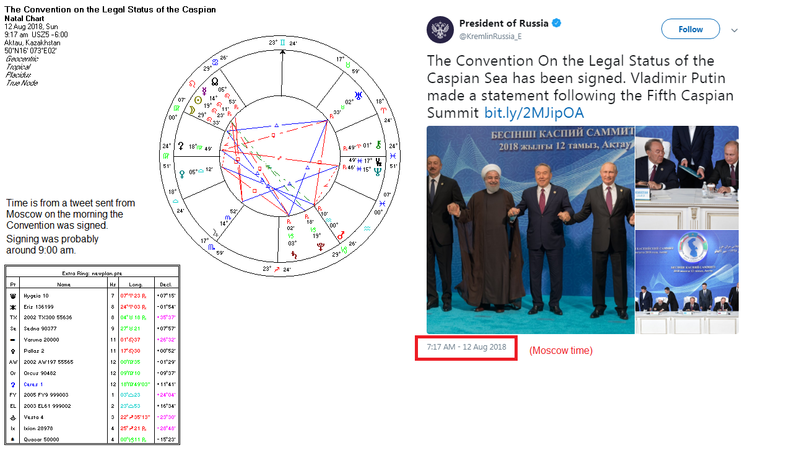 In it we see the agreement (7th house) is ruled by Pisces (large bodies of water and seas), with Neptune in the 6th house (services and military). 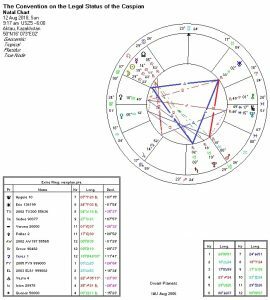 Neptune in turn is trine to Jupiter, showing that the accord will have success, and is conjunct the Vertex in the 6th house (services and military) showing the visionary character of the agreement. In addition, there is a dissociate grand trine between the Moon, Saturn and Uranus, with Saturn and Uranus in earth signs, earth governing territories and land in general. This is a very tenacious combination. 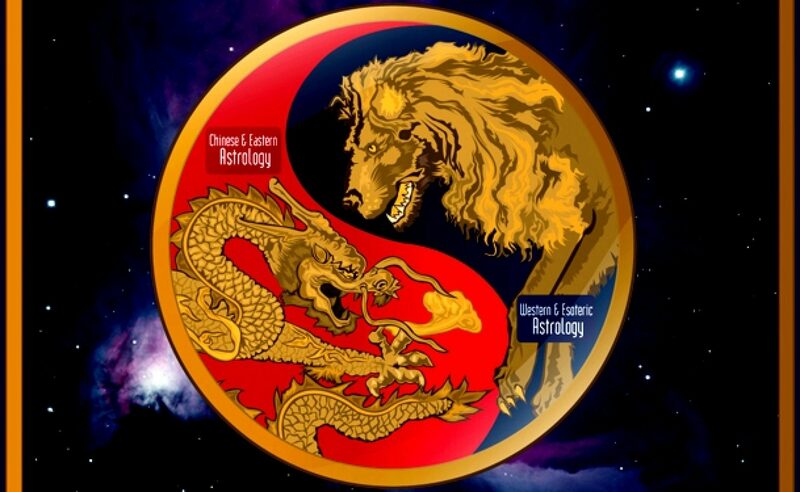 And, with the Moon in Leo in the 11th house (maybe), it marks the friendships and optimism displayed in the signing. The Virgo Ascendant shows the detail and careful negotiations that went into it, with a Mars/Uranus square showing the great independence expressed by the five states and the hands-off attitude toward foreign powers. There is also a Venus/Saturn square which further enhances the idea of careful negotiations, as well as the hands-off attitude. In all, it is a remarkable chart for an equally remarkable agreement. The signatories are each responsible for security in the region, as well as for environmental damage and upkeep. Caspian Sea sturgeon produce the finest caviar in the world, for instance. It defines the Caspian as a sea. Apparently there was some conflict on the definition. It was also the biggest reason Iran was a holdout, because had it been a lake, Iran would have gotten 1/5 of the benefits from the resources. Now they have only 15%, and with the least amount of gas. They make up for it in the Persian Gulf. But perhaps most importantly from the standpoint of current Russian/Western relations is the fact that now Russia cannot be excluded from energy developments in the Caspian region, in addition to strengthening its diplomatic efforts there and in the immediate vicinity. It assures Russian dominance in the region. This Convention will bring considerable benefit to the states of Central Asia, creating possibly millions of jobs, increasing the living standards of tens of millions, increasing their security, and it will accelerate the construction of a transport corridor between Europe, Russia, Turkey, Iran, India and China, with all that entails and implies. And, finally, the latter transport routes will be secure, unlike the current sea routes through the Indian Ocean which are open to interdiction by NATO and US naval forces. Although it received little attention in the Western press, the Caspian Convention was one the landmark decisions in the emerging multipolar world order, and an earthquake under the feet of the globalists in Washington and Western Europe. Of course, the latter is probably why we didn’t hear much about it. Great post, I would think this would temper the USA western led hegemony, something that needs balancing in the challenging times ahead. Thanks Sam. Yes, it should, so long as the situation in Syria doesn’t escalate. That would destabilize the whole region. Kudos to the signers of the agreement, though. I would imagine the think tanks in Washington are none too happy about it. 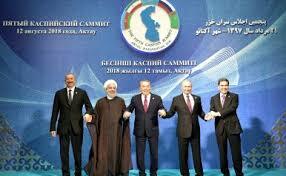 The agreement should be a good bulwark for stability in the Caucasus/Caspian region. It is right in line with the emerging greater Eurasian economic bloc. Previous PostPrevious Is war with Iran on the horizon?